Ranch style home featuring 3 Brs and 1 bath, EIK, Formal Dining room, Living room, Wood Floors, Large Backyard, Quiet Block. Sold As Is. Similar homes that sold in bidding wars went $15k above asking price on average, but some went as high as $79k over asking price. Hello, I’m interested in 44 Harriet Ave and would like to take a look around. 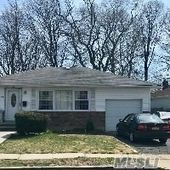 The details on 44 Harriet Ave: This house located in Hempstead, NY 11550 is currently for sale for $295,000. 44 Harriet Ave is a 1,075 square foot house with 3 beds and 1 bath that has been on Estately for 3 days. Listing Courtesy of: MLSLI and LAFFEY REAL ESTATE.